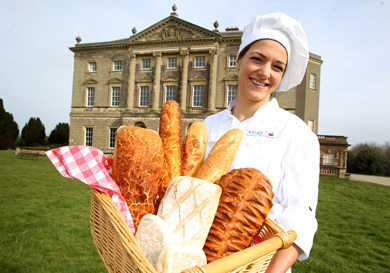 The global bread tour at Castle Ward returns on Bank Holiday Monday 5 May as the International Bread Festival prepares to tantalise your taste buds with breads and foods from around the world. The third bread festival is just round the corner. 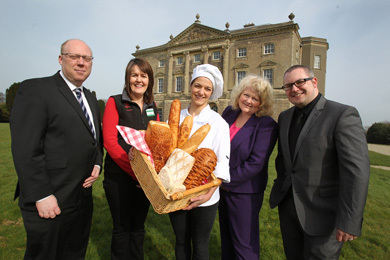 Peter McVerry, U105, Jacqui Baird and Ruth Robinson, Castle Ward, Michelle Shirlow, Food NI and Russell Whittaker, NITB, launch the International Bread Festival at Castle Ward for Monday 5 May. The magnificent National Trust place near Strangford will welcome for the first time, celebrity chefs Angela Harnett and Atul Kochhar. Angela is best known for being Gordon Ramsey’s protégé; she is one of the very few female chefs to have achieved a Michelin star. Atul was the first Indian Chef to gain a Michelin Star. His unique fusion of Indian cuisine has made him one of the most influential chefs currently working. Angela and Atul will be joined by the French master baker, Richard Bertinet, to help celebrate our unique bread culture. All three celebrities are regulars on BBC’s Saturday Kitchen. The festival, now in its third year, brings together bakers and bakeries from near and far, great music and plenty of fun and games for all the family. As preparations get underway for the big event, Jacqui Baird, Visitor Services Manager for Castle Ward, said: “The Bread Festival is a fantastic opportunity to celebrate our amazing bread culture in Northern Ireland. It will showcase the best of bread from across the country such as barmbrack, soda breads and our famous potato breads. There will also be a strong international theme with breads and foods from India, Europe, America and UK as well as some traditional food from Ireland. Ruth Robinson from Castle Ward gets into the swing with a basket of fresh bread. “We are very excited this year to offer our visitors a unique chance to see what Castle Ward would have been like 150 years ago, as we bring our farmyard area to life. This area was once the heart of the estate with the Ward family leading the way on being self-sufficient. During the day we will have our very own corn mill in action showing you how the corn was ground, as well as demonstrations from the Ulster American Folk Park and other traditional crafts and food producers. During the Bread Festival there will be something for everyone to enjoy from live music, children’s activities, demonstrations and talks as well as a chance to see what life is like behind the doors of the mansion house. The Bread festival runs from 10am – 6pm on Monday 5 May 2014.
or call Castle Ward on 028 4488 1204.